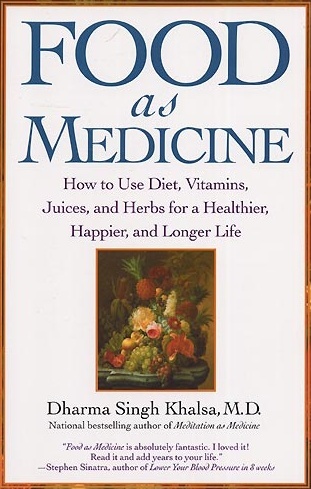 Grounded in medical science, Food as Medicine by Dharma Singh Khalsa, is a pragmatic and accessible reference for anyone seeking guidance on healthy eating or simple food remedies. Grounded in medical science, Food as Medicine is a pragmatic and accessible refernece for anyone seeking guidance on healthy eating or simple food remedies. 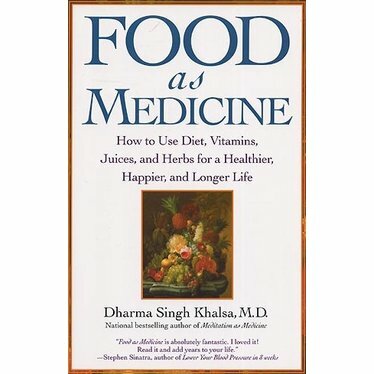 Dr. Khalsa begins by setting readers on the right nutritional path - regardless of there current eating habits - and explains how to go organic, how to use natural organic juices and foods as medicine, and how special-food diets can help reverse the progress or diminish the symptoms of certain diseases, such as Alzheimer's or Hepatitis C.
The book is filled with interesting food facts: Blueberries can increase brain longevity through their ablilty to help release dopamine in the brain. Kiwi fruit, because of its high levels of disease-fighting antioxidants and phytonutriens, is said to be an excellent source in battling cancer and heart diesease. Pears, with their high content of certain minerals and fibers, can help prevent fibroid tumors. Drawing on Dr. Khalsa's own life experience as well as patient case histories, Food as Medicine outlines the seven principles of "The Khalsa Plan", details information on his other nutrinional plans designed to target specific ailments, and lays out dozens of delicious, time-tested recipes that promote overall health and well-being.